When you take time off for travel, you seldom want the journey to end. 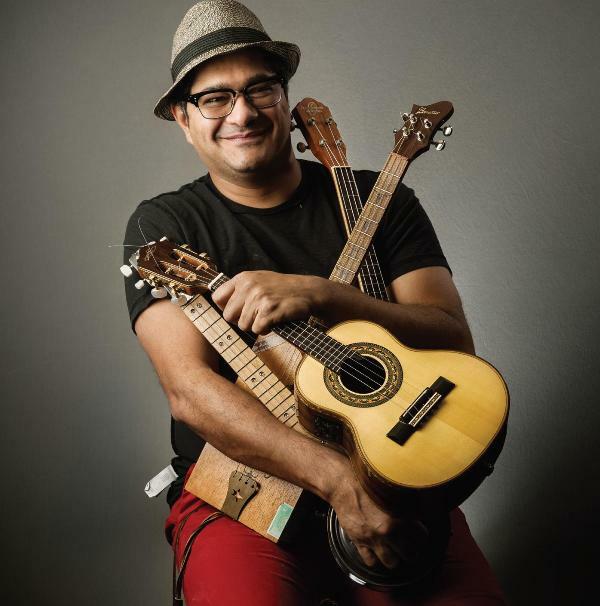 Guitarist Dhruv Ghanekar explains that makÂ­ing an album is no different. It’s no wonder then that his second album is named Voyage. “One of the problems with doing your own music is that you never actually finish it. You can continuously keep working on it; it’s one of those things,” says the composer, guitarist and singer, when we meet him at his recordÂ­ing studio in Khar. A dozen glistening guitars are neatly stacked in one corner and several hard-cased pieces of what looks like a large percussion set-up have just arrived, informs the staff, from Taufiq Qureshi’s group. Now that the album is done and dusted, Ghanekar looks relieved and stage ready even. The nine-track compilation, which is a marriage between jazz and Indian folk, feaÂ­tures a striking list of guest artistes. The title song is quite a globe-trotter, boasting AmeriÂ­can soul singer-songwriter Raul Midon, CamÂ­eroonian/French bassist Etienne Mbappe and home-grown heroes, percussionist Trilok Gurtu and drummer Ranjit Barot. “I call this one the United Nations song,” jokes GhanekÂ­ar. The making of the track was a long, pieceÂ­meal affair that required some “devious planÂ­ning.” “Raul recorded the song when he came to perform in Mumbai. I had sent him the track earlier and he had liked it. Etienne also recorded when he came to the city, and Trilok, when I was performing with him two years ago. So everything came together in differÂ­ent points in time,” informs Ghanekar, who is also the founder of Blue Frog, one of the best music venues in the country. Of course, Blue Frog is also where most of the musicians who have guested on the album took to stage. Another song, which features singer VasuÂ­da Sharma, is one he labels the most mainÂ­stream. “This is by far the most popular track. I am working on a video for it,” he inÂ­forms while pushing play. The easy-on-the-ear and poppy “Sway with me” glides from Sharma’s Hindustani classical-style delivÂ­ery in Hindi to Ghanekar’s anthemic English vocal piece and back. As the song fills the air between us, a quick visual scan of the studio reveals that it is an exceptionally designed space that shows off Ghanekar’s vibrant InÂ­dian folk leanings and Western music inÂ­fluences. As far as folk music is concerned, it’s all in the family for the guitarist. With ”˜Dhima’, the composer roped in one of the most well-known names in the industry, Ila Arun, who also happens to be his mother-in-law. None of the boisterous hoots and overly sensual moan-grunts Arun became famous for in the Nineties Hindi film hit “Choli Ke Peeche Kya Hai” are found on this track; this song has Arun gently serenading you before hooking you to the groovy, chant-like reÂ­frain. Says Ghanekar, “This tune came out of a project I did with her two years ago where we took Rajasthani music and turned it on its head.” “Dhima” also highlights the genius of Algerian percussion prodigy Karim Ziad and Mauritian jazz bassist Linley Marthe. “If you’re hiring a great musician, you don’t want tell them what to do. While recording them, I didn’t want to draw out all the cue points. A good musician always brings someÂ­thing to the table and ups your game. With these songs, there has been back and forth, but we finally arrived at things that worked,” explains Ghanekar. Was getting all the big-name musicians on board a challenge? “No, strangely that was the easiest part; the most difficult thing was the subtraction after the recording. It had be cohesive, I had to make a lot of deÂ­cisions, and that took time. I have literally mixed each song 15 to 20 times,” he recounts.